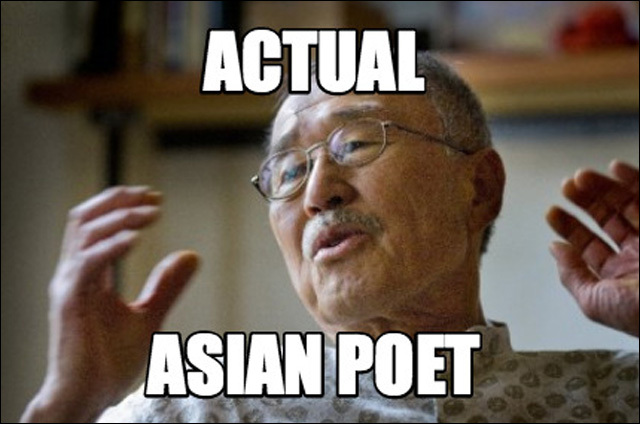 The Collected Poems of YFC: "This blog is authored by a group of Asian North American writers who are responding critically to Hudson's exploitation of an Asian American identity. We support the demand that Hudson stop using the name of Yi-Fen Chou." When White Poets Pretend to Be Asian: By now, you may have heard about the racefakery of Michael Derrick Hudson, who took up the pen name "Yi-Fen Chou." This is not a new thing. When it comes to literary hoaxes, it seems somehow easier to fake Asia, a land still distant and inscrutable to many Americans. They Pretend To Be Us While Pretending We Don't Exist: White poet Michael Derrick Hudson's use of the Chinese pen name Yi-Fen Chou was an act of yellowface that is part of a long tradition of white voices drowning out those of color in the literary world. Jenny Zhang writes a powerful essay talking about the struggles of being a woman writer of color. Why A White Poet Posed As Asian To Get Published, And What's Wrong With That: Ken Chen, executive director of the Asian American Writers' Workshop in New York, comments on Michael Derrick Hudson, the segregated labor market, and coming up with a #WhitePenName. Two Phenomenal Asian American Poets Published in Best American Poetry 2015: Let's forget about Michael Derrick Hudson and talk about Jane Wong and Monica Youn, whose poems appear in Best American Poetry 2015. What's your #WhitePenName? All the way back to Plymouth Rock, guys. 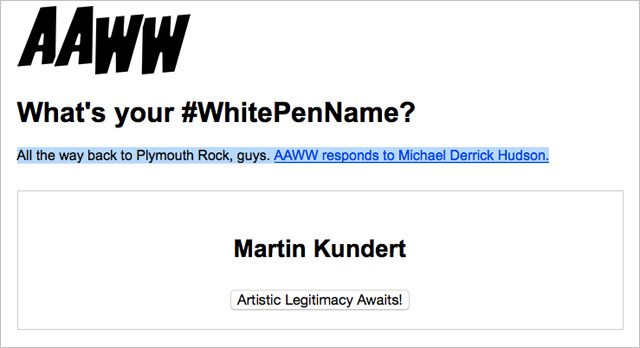 AAWW responds to Michael Derrick Hudson with this handy and hilarious White Pen Name Generator. I got Martin Kundert. This Is the 9/ll Legacy America Doesn't Want to Remember, But Should: After 9/11, the number of hate crimes spiked -- and the number targeted who were read as Muslim also went up. #AfterSeptember11 shares heartbreaking stories of racism, prejudice and pain: The #AfterSeptember11 hashtag is a collection of more than 50,000 heartbreaking accounts of people who say they were targeted for being Muslim -- or often, just for having brown skin. The Unknown Chinese-American Heroine of September 11, 2001: Flight Attendant Betty Ann Ong, who died on board American Airlines Flight 11 -- one of the planes that flew into the World Trade Center -- is considered the first hero of that fateful day. Dispatch from the Floor of the Model Minority Factory: "The Center promised a new kind of educational culture, and perhaps most importantly to me, because I'm Asian American myself, a way to support and give back to my communities. But it all went wrong." 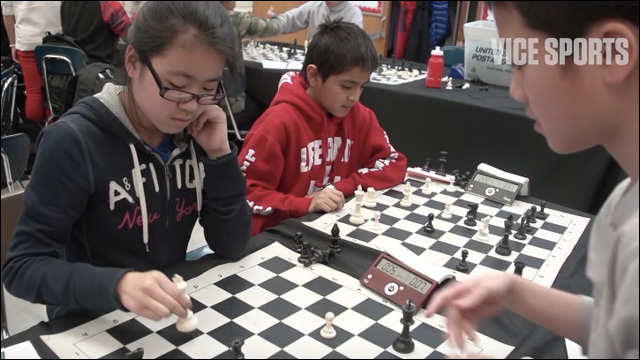 American Exceptionalism and Why I'm Proud to Be an 'Anchor Baby': Raymond Yung Lin is proud to be an "anchor baby," and shares a story that he says is not that different from millions of immigrants in the U.S.
Queens of Brooklyn: The NYC Girls Dominating Youth Chess: A group of girls from Intermediate School 318 in Brooklyn, New York -- which has the best scholastic chess program in the country at any grade level -- are out to change the old idea that chess is a "man's game." Why Asian Americans have diabetes but don't know it: "More than half of Asian Americans with diabetes don't know they have the condition, according to new research that quantifies, for the first time, how common diabetes is among that minority group in the United States." Akron's North High School now half Asian, owing in part to Bhutan refugees: Bhutanese and southeast Asian refugees are changing the appearance of Ohio's Akron neighborhoods and now the makeup of some Akron Public Schools. The Architect Poy Gum Lee Finally Has a Retrospective: Chinese American architect Poy Gum Lee, who designed buildings in New York and China from 1923-68, receives his first retrospective with the Museum of Chinese in America. Two Seattle girls launched a balloon to the edge of space this weekend, and have the video to prove it: Last weekend, Kimberly and Rebecca Yeung built a handmade spacecraft out of wood and broken arrow shafts, and launched it 78,000 feet in the sky to capture the view from the edge of space. 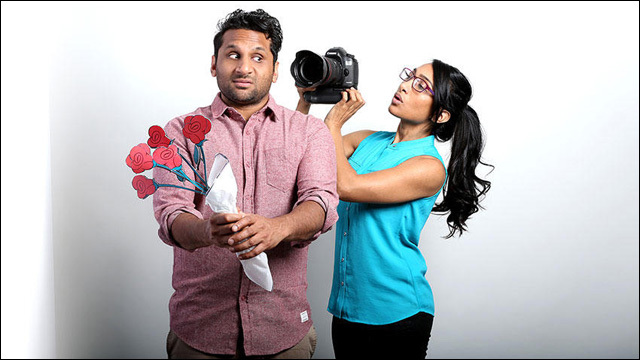 'Meet The Patels': One Man's Quest To Find Love, The Old-School Indian Way: Ravi Patel and his sister, Geeta, worked together on the documentary Meet the Patels, in which Ravi struggles to find a partner both he and his parents love. Comedian Margaret Cho Interviews Her Mother The Golfer: Melanoma, lesbians, Kim Jong Il, and golf...Margaret Cho interviews herself as her mother. Mindy Kaling: By the Book: The actress, producer and author, most recently, of Why Not Me? secretly read in bed as a child. "My parents encouraged reading, but they didn't anticipate me reading Michael Crichton's 'Sphere' until 2 a.m. on a school night." Zen Cho's debut novel, Sorcerer to the Crown, is a Regency romance novel that centers on Britain's colonial territories. And tea, magic, and dragons. Geek Dreams Come True With Zombie Screenwriter Mike Le: Screenwriter Mike Le, whose next feature film Patient Zero, talks about how a geek like him found sucess in the film industry.